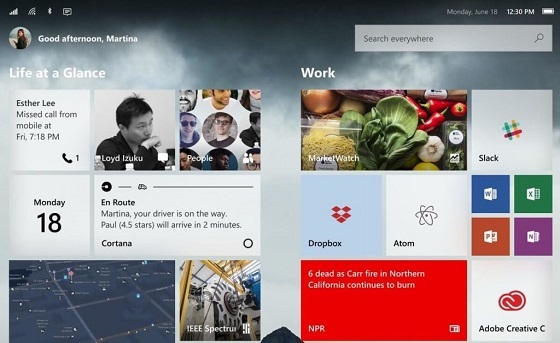 Enthusiasts and designers are giving Microsoft fans a look at the possible design of the modular Windows Core OS for foldable mobile devices. The latest concept from designer Harry Dohyun Kim and Michael West shows off a beautifully reimagined version of Windows on foldable phones with a complete Fluent Design overhaul. At first glance, you will notice that the Start screen is modular that means it can adapt to any form factor. The interface of the Start screen is nearly the same on both phones and tablets. Another noticeable change is that the Cortana icon has been moved to the right side of taskbar so it can be easily accessed on small screen devices. There is a status bar at the top of the screen with information about the connectivity (cellular, WiFi, Bluetooth) and the time. The tiles have Fluent Design feel and there is a search bar on the top right corner that would allow the user to search everything stored on the computer. It’s important to that this is a fan art and Microsoft won’t implement such changes in Windows 10. But the company is said to be working on Windows Core OS which is a modular platform with major design changes and a bunch of new features. This is definitely a cool idea that many would like to see on dual-screen foldable mobile devices.